Together we will learn about the social justice issues facing the ports we enter. 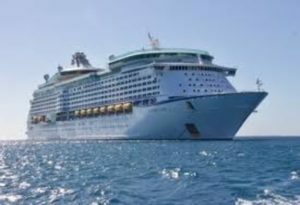 You and your group will set sail on a 4 or 7-day cruise. 5-Hour Experiences in and around Los Angeles exploring issues and meeting face to face the people making a difference in our city. 3, 4 & 5-day trips for your disaster relief team. 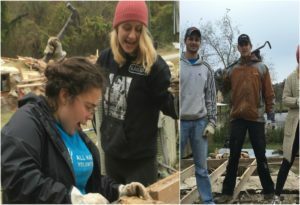 We will plan your teen or adult disaster relief trip from start to finish. Let us worry about the details while you focus on rebuilding. 3, 4 & 5 Day Trips to Appalachia. Learn about a part of our country that is often hidden. Help build and repair houses, meet the locals and enjoy the local culture. Arizona has historically taken in more refugees than all but just a handful of other states. 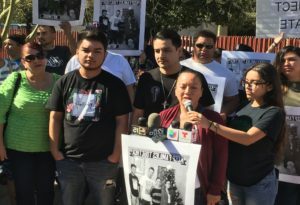 Meet the Jewish community of Phoenix, as well as refugees, DACA recipients, immigration lawyers and even an ICE agent. 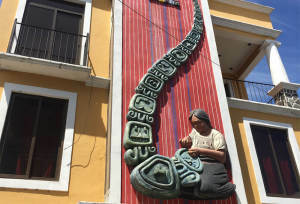 Great adventures await you in Guatemala. Explore the country, learn about the Mayan culture, sip fair trade coffee while studying Jewish texts, kayak, zip line and much more. Only 900 Jews live in Guatemala and your visit to them means a lot to their community. 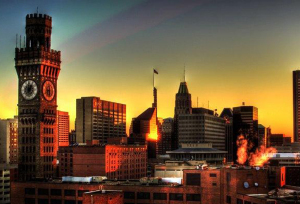 3, 4 & 5 Day Trips Explore the fun and culture this city has to offer. Travel to the Jewish sites and neighborhoods. Learn firsthand the various ways this magical city deals with its many social justice challenges. 3, 4 & 5 Day Trips in Seattle, Baltimore, Boston, San Francisco or any city of your choosing. Temple Emanu-El of Dallas had an amazing trip experience with Avram and Tzedek America. 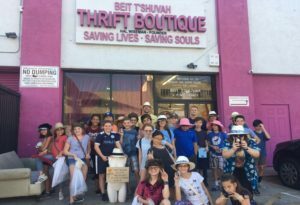 Avram helped to create a memorable and fun Jewish Los Angeles trip, which also involved meaningful social justice work. We hit hot spots like the Hollywood Sign, Santa Monica Pier and The Walk of Fame! 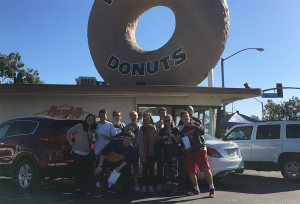 We spent time exploring Jewish Los Angeles by visiting the Willshire Blvd. Temple and eating at a Kosher Restaurant in the Jewish Neighborhood. We also did important and eye-opening work with the homeless population. Avram was resourceful, easy to work with, and an awesome tour guide. Our trip was amazing, and we cannot wait to do it again next year! Working with Avram and Tzedek America gave me the opportunity to create a custom program that I knew would be perfect for the CIT’s of Camp Daisy and Harry Stein. Avram was extremely helpful in creating an itinerary that balanced all of our needs, brought educational insight to the trip, and of course offered tons of fun! 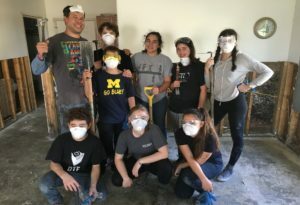 Our teens not only built a relationship with each other and learned about the part they can play in bringing social justice to our world, they also built a strong connection with Avram and Tzedek America. I just wanted to reach out to you to express my thanks for providing an amazing experience for the Camp Stein Ozrim. My daughter, Annie, has not stopped talking about the time she spent in L.A! The trip really made an impact on her. She proudly wore her Homeboys shirt to Kutz when we put her on the plane.